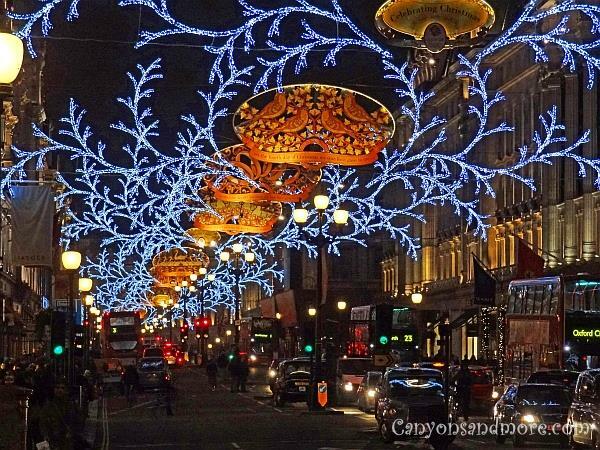 London rocks at Christmas. 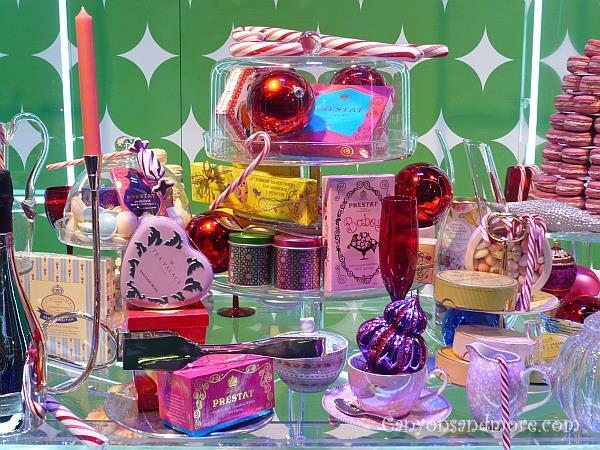 Many of the stores such as Marks and Spencer, Selfridges, Harrods and many others had their windows embellished in such trendy and untypical colors for the holidays and window shopping is just so much fun. It looked so magical somehow and it felt like being a child again. 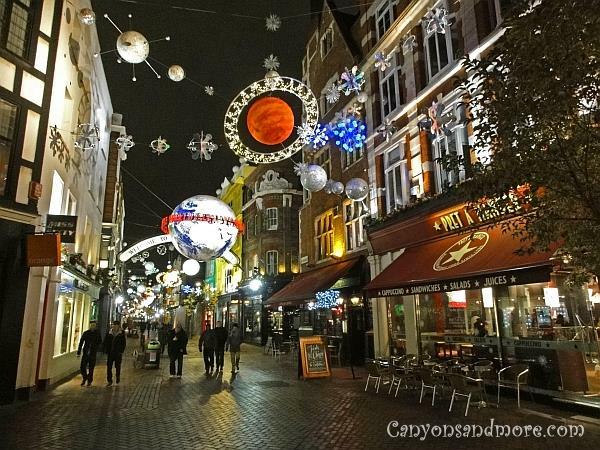 The street lighting was always impressive and Carnaby Street is a highlight each year with a new theme for the holidays. 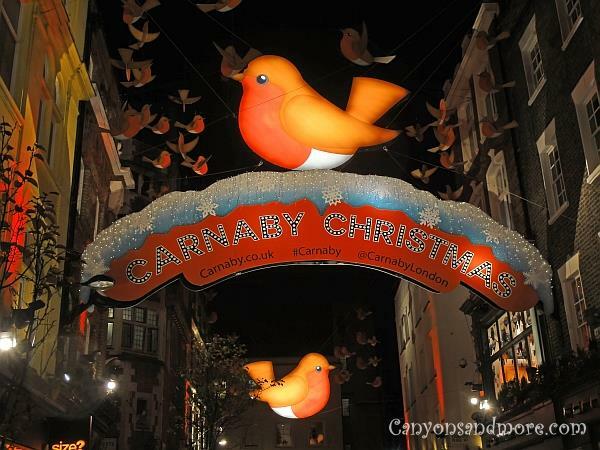 The image above shows a very cute theme for decorating Carnaby Street at Christmas time in the year 2013. Robins are charming little birds and are anyway popular as motifs for Christmas cards and ornaments. 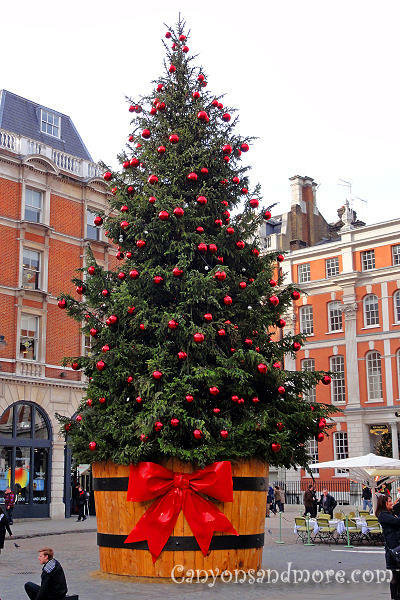 London is so festively decorated during the Christmas season. It is fun walking down the streets and admiring the lighting and the store windows. 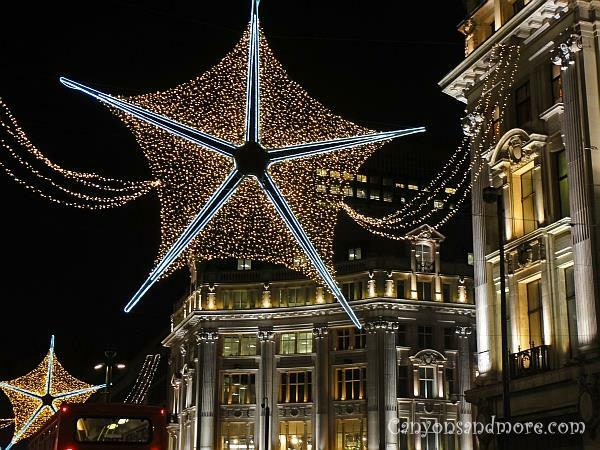 This is an example of an impressive star from the year 2011 that was hanging at Oxford Circus. 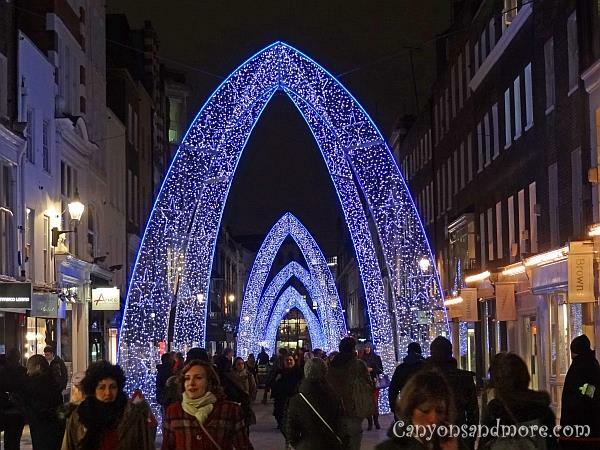 These blue arches are a highlight of Molton Street and should not be missed when shopping during the holidays in London. Each of the days in the popular Christmas song “The Twelve Days of Christmas” was beautifully represented in this fantastic street decoration which extended down Regent Street in London, England in the year 2012. The decorations were literally out of this world in 2010. Celestrial bodies hung all along Carnaby Street and gave it a great space feeling. 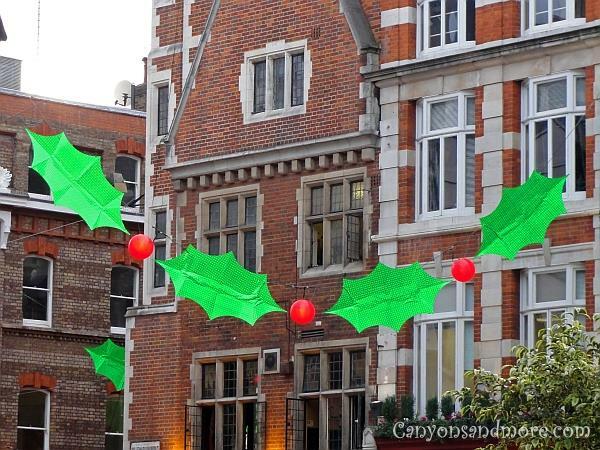 Holly leaves and mistletoe are traditional Christmas motifs and gave a natural holiday look to Carnaby Street in the year 2011. 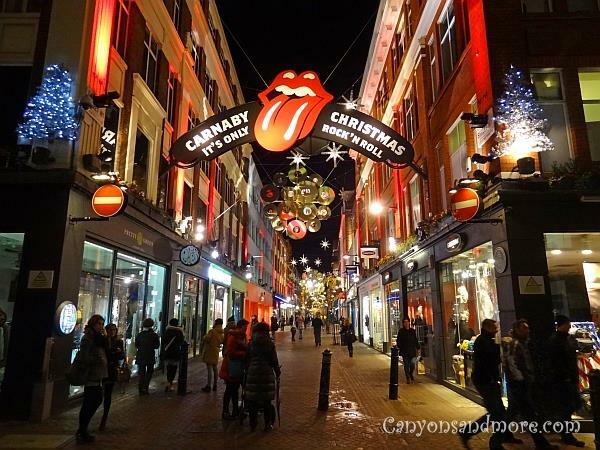 The Carnaby Street decorations in 2012 were dedicated to the fabulous Rolling Stones. As you walked down the street, globes of golden records were hanging at the intersections. London is so festive during the holidays. There is nothing more fun than walking down Oxford Street and looking into the shop windows during the month of December. Aren’t these such cheerful lively colors used in these decorations? 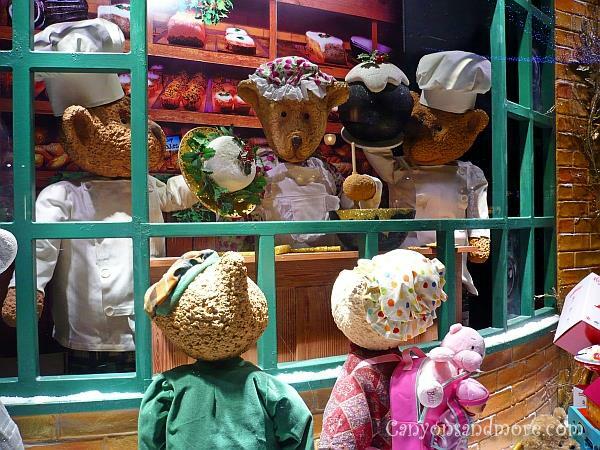 These store window decorations in London’s famous Hamley’s Toy Store will make you want to be a kid again. While at Hamley’s it is also worth to go inside, even if you have no kids to buy toys for. They actively demonstrate their new toys and if you are lucky, a group of elves will sing Christmas songs for the crowd. It is a unique experience which involves the customers in a fun way. Covent Garden is already a shopper’s paradise with all of its small and unique boutiques and market stands. During the Christmas season it is also festively decorated to add even more cheer to the place. During the year 2011, this large and handsome tree embellished the outside of the entrance.